Also known as Sweethaven, Popeye Village is the actual set used in the 1908s musical of Popeye starring Robin Williams and Shelly Duvall. 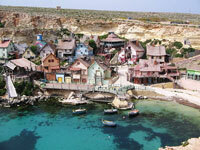 Since then, the set has grown into one of the country's major tourist attractions and is a must for those travelling with children in Malta. Kids can wander around the authentic wooden buildings such as the bakery, post office, and school house. But there's also lots of fun activities for the whole family, including meeting famous cartoon characters, boat rides, water trampolines, sun bathing decks, and games. The park now boasts the Popeye Comic Museum, showcasing more than a hundred original comics dating back to 1936. Sweethaven hosts fun stuff for kids but also organises adult events like team building exercises upon request. The little village is gorgeously situated and quite charming. The opening times and activities vary according to the season so it's best to check the official website for information before visiting in order to avoid disappointment.